The Daily Dimwit: 2011 Topps Chrome - A Pack A Day - Pack 16 of 24 - AND GROUP BREAK SIGN UPS! 2011 Topps Chrome - A Pack A Day - Pack 16 of 24 - AND GROUP BREAK SIGN UPS! THERE IS A GROUP BREAK SIGN UP AT THE END OF THIS POST!!!! A who's who of pitchers I'm not familiar with, oh wait, that first guy is an outfielder... DeJesus... why is that name familiar? Oh yes, the 8 billion Gyspy Queen autographs he signed... haha... three more base cards I needed! Sweet! And today's insert is a Heritage Chrome Ichiro... a very nice looking card, the scan does it no justice! With the Gypsy Queen group break shelved.... I've got another one in the works. How does 3 hobby boxes of 2011 Topps Chrome sound? It'll be two-team per slot break and thanks to the good friends over at Atlanta Sports Cards, it'll only come out to $13 per person shipped!!! For two teams!!!! Alright, I'm not taking the Astros this time because I already have the team set 3 times over, so any other Astros fan, this is your chance to get them in my break! First 15 teams claimed will be set, then the remaining 15 will be randomized off. And to settle this before it becomes an issue, if we pull another Team USA Auto 5-card pack, those cards will be randomized off amongst those participants who do not get a hit. Send your $13 payment to paypal address: samuelpair(@)yahoo.com. Please let me know if you have questions. (I have reserved the Braves for Derek due to a previous agreemeamnt and slight on my part). I'll take the Rangers again! 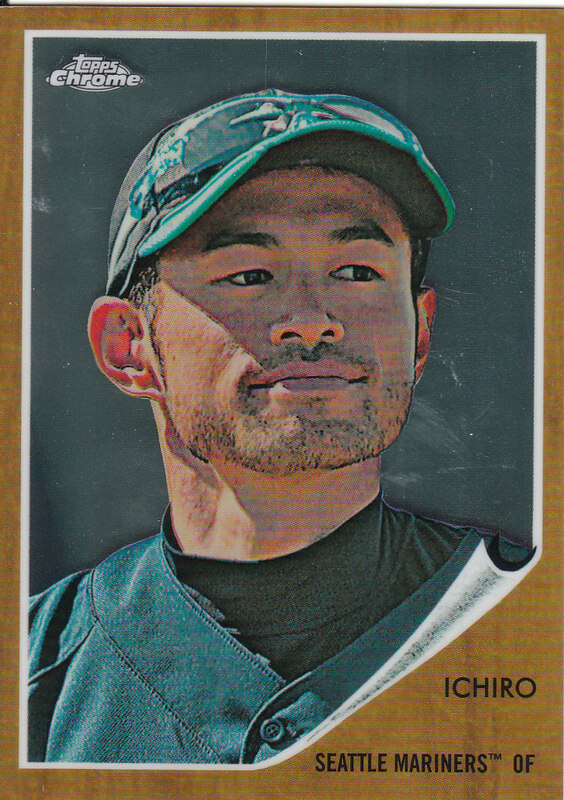 I'm sick of Ichiro cards having no last name, but they still put Ichiro in the tiny font with a big gap. Get a clue, Topps, if he only has one name for the card, put it in a bigger font. I'll take the Yankees! Payment on the way, thanks! I'll take the White Sox, payment to follow.